VW Campervans available for hire across the county including from bases in Hastings, Bognor Regis, Horsham, Worthing. If you’re from or visiting West Sussex, contact one of our camper owners about their vans. They have campervans for rent to Camperbug users, hire a vw from Crawley, Chichester or East Grinstead. I am Drina, hire me today! Be the envy of the open road in our brand new 2019 luxury 4-berth VW California Ocean! Perfect for friends, a couple, or a small family looking for an effortless holiday or getaway. Molly is a 1977 Devon Bay window, right hand drive Campervan, with pop top. 2008 Brazilian VW Kombi Danbury Campervan 4 Berth for a Fantastic Journey...!!! 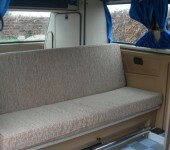 VW type 25 westfalia pop top, 4 berth,fabulous for families. A beautiful classic ruby red T25 VW campervan. Recently brought back to her former glory with a total internal refit and external respray. Ruby definitely turns heads and would make the perfect companion for a glamping holiday in style. Available to hire from May 2019.